You have found the best way to decolorize your clients' hair, then choose from a variety of lighteners you can count on. You'll find liquid, creme, powder and gel lighteners. Available by Clairol. Basic White lighteners are just what you need for every fantastic blonding job. Basic White Extra-strength powder lightener provides balanced lightening for healthier-looking highlights. With results that are predictable. 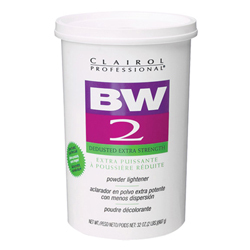 BW2 is an extra-strength powder lightener dedusted to minimize powder fly-away. It lets you create a full range of subtle-to-dramatic lightening services (off-the-scalp applications only). BW2000 is a virtually dust-free lightening concentrate enriched with wheat germ and mineral oils for added conditioning, and a pleasing citrus fragrance. Use BW2000 to achieve stunning highlights on brunettes, redheads and blondes. And no dusting. Luminize special effects liquid lightener easily provides natural-looking, all-over brightening - gently and brilliantly. In practically no time.